Bumpy Pitch has paid homage to many great soccer teams of the past and present over the years and their new “Piraten Klub” tshirt released this week is an tribute to FC St. Pauli, the 102-year-old German side. I really dig the shirt’s design but to be honest the first few times I saw this design the “Punisher” logo came to mind. 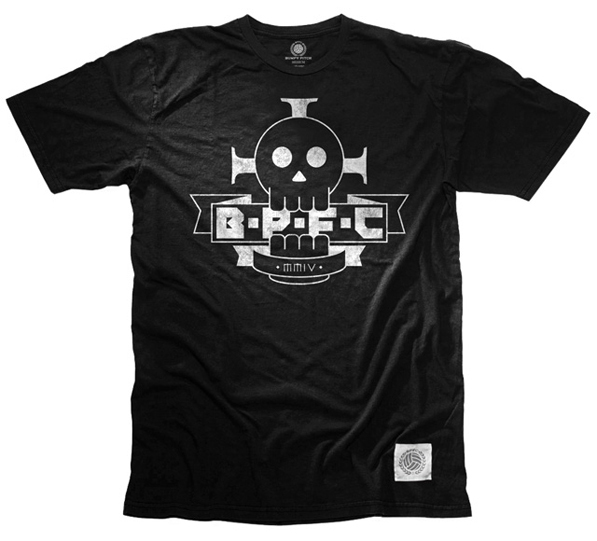 But those were quick glances and when I had a real chance to look at the shirt I really liked the look of the skull chomping down on the BPFC initials. The cross in the background has a nice stylized potent cross look to it and the symbols together are a nice nod to the cross in the FC St. Pauli crest and the skull and crossbones that has come to be the symbol of the teams’ supporters. We love and are grateful for everyone on our Allies List, but last night two members of the MLS family took some time out of their days to do something special, and we wanted to take note of it, as well as give them a thank-you. They are former MLS player and current Real Salt Lake and Fox Soccer analyst Brian Dunseth and Real Salt Lake Defender Chris Wingert. Dunseth also keeps us looking good and well informed as the co-owner of Bumpy Pitch and The Original Winger. So what did they do? They participated in the NOH8 Campaign’s first photo shoot in Salt Lake City, at Saint Paul’s Episcopal Church. The NOH8 Campaign was born as a silent protest to the passage of Proposition 8 in California, but since then has grown to stand for GLBT equality far beyond the issue of marriage. Over 20,000 people from all walks of life have participated in NOH8. Subjects are photographed with a temporary “NOH8” tattoo and duct tape placed over their mouth. Dunseth and Wingert are the fourth and fifth soccer personalities to participate in the Campaign, following in the footsteps of Portland’s Mike Chabala, Chivas USA’s Michael Lahoud, and Montreal’s Justin Braun. You can check out their pictures on the Allies Page and we look forward to seeing the results of last night’s shoot!